-439+ MB free in C drive after flashing. -EmulOFF v1.00 in CORE (Can be removed). -Check-In added as an extra component with Latest Maps. (It's not available in latest Nokia Maps) (Only in English version). -New Mail application from Microsoft Business Apps bundle. -Backup and Restore. A separate document is available for more explanation about it. -New tool called Delight Resolver that will help you to sort out minor/major problems yourself. (It will also gives you an option to backup your registry so once you hard reset or flash your handset, your apps in E drive won't be gone). A separate document is available for more explanation about it. -Guardian app (Free Edition) in CORE. Protection from removing it after a restart or even after a hard reset (called shadow copying, not available in official release). Also disabled checking for updates after 15 days (Restriction in Free Edition in official version) - For more info, check FAQ. -Default Big screensaver changed if you set your clock in Digital mode. -New Slide Animation Screensaver from Anna by L0VELAS. -New B&W Music Player Screensaver from Anna by L0VELAS. -LanternSoft AlarmClock Screensaver v1.00(0) in CORE, upgradable. Can be uninstall. -Small Contact widget by L0VELAS. -Translucent Small Calender widget by Novag with orange and white font. -Transparent Mechanical Clock widget by Zinox. -Transparent Digital Clock Widget with White Font added as an extra widget. -Transparent Profile Widget added as an extra widget. -2 Big Clocks (One default and other one is Plangi BigClock Widget by IND190) + 1 -Mechanical Clock + 1 Medium Clock + 1 Small Clock = 5 Analog Clocks. -New Gallery Widget from Nokia 808 ported by erorcun (with Semi Transparent Borders from joshlog). -Most of the widgets are Translucent (Semi-transparent). -Mod to provide more RAM to most of your apps and improve performance. -Camera app process left alone so camera app can be started soon enough. -New Power Key Menu with Symbols for all options. Mod by 7b - modded for English by me. -All apps and mods will remain after a hard reset except Quickoffice and Adobe PDF reader as they are in UDA. They can be removed through application manager. -Push to notifications apps will work even after a hard reset. 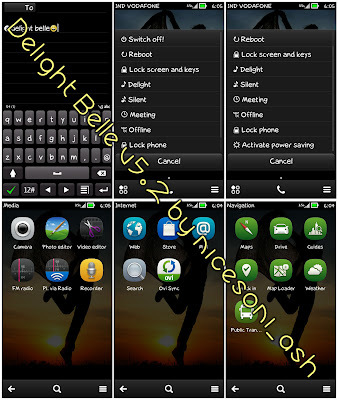 -Delight Belle Blog's RSS added. -Phone_as_modem.iso is in E:\system\ drive now so saving 7+mb from your C drive as Delight.iso. Rename any ISO you want to mount on your PC and name it as Delight.iso and put it in E:\System\ then connect your handset in "Use phone as modem" mode and that new ISO will be mounted. -Set performance and battery usage to medium so it won't be lagging as well as won't consume too much battery result in better battery power management. -No more unwanted images in Gallery, Wallpaper selection and Gallery Widget walls selection. 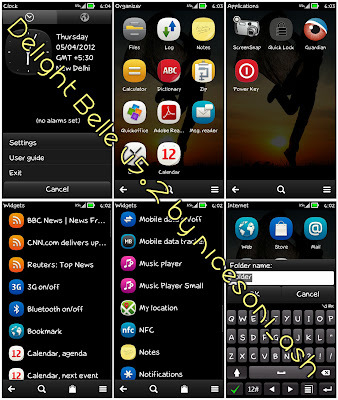 -Some default Belle ringtones removed to gain more space. Get them from Downloads section. -Adobe Reader and Quick office (from original Belle UDA) added and can be removed through application manager. -Alarm.twk and Sysap.twk along with Tweaks.sis are in E:\Tweaks-Plugins. Install Tweaks and set their options manually. (Tweaks Homepage). -When you press menu in lock mode and rotate your handset, locked screen will rotate according to that and will stay the same. -Any profile's name can be edited now. -All new widgets including few older ones are in C drive now so it's easy to install a new one or change their mif files. -Auto Lock time set to 2 minutes. -Read/Write Full access to c:\ drive (instead of just c:\data) from original Belle File manager. -Disabled the query dialog when you save a site certificate. -Sms sending retries to unlimited, when the sending got error. -Allow applications renaming in menu and creating folder under folder. -Push to Notification files exist even after a hard reset so apps like Nokia drops etc will work even after a hard reset. -New Fonts with bigger smiley size. -Jlmvc - Smooth Effects v2.1 + Few default fonts. -All widgets are free from any instance restriction. i.e. Place any number of the same widget on any home screen or on the same home screen. -All widgets will be there even after a hard reset. -GPS location locking is fastest as ever, in my phone within 2 seconds. -Patched installserver.exe is in C:\sys\bin. So you can remove it too and use Installserver patch from RomPatcher+. -Keylock Vibration mod moved to C drive so it can be restored easily. Read FAQ for more info. -Tactile Feedback mod moved to C drive so it can be restored easily. Read FAQ for more info. -Kinetic Scrolling mod moved to C drive so it can be restored easily. Read FAQ for more info. -Domainsrv will be there even after a hard reset. -Disabled cleaning Log after changing SIM. -Disabled notification when changing profile from Offline to any. -Disable notifications about power saving events. -Power Saving enabled/disabled automatically according to battery power. -FM Transmitter notification popups disabled. -Full access to system folders without RomPatcher by default. -Switch off and Reboot speed boosted to maximum. -Removed shutdown animation feature. You [B]can't[/B] return it back. -Sysap in Portrait mode always. -Alarm Snooze Time 10 minutes. -Calender Event snooze time 10 minutes. -Alarm and Calender default tones changed. -Auto Lock Phone set to 2 Minutes. -Headset is default now in Accessory settings. -Smoothness in Video Rendering increased up to three times. -RAM and Drive Memory threshold settings Changed. --Good RAM Threshold - 133 mb. - Set to 110 mb. --Low threshold for RAM - 100 mb. Set to 80 mb. --Low threshold of disk space where a warning issued is 95% - Increased to 98%. --Time interval for which the program should crash increased to double. --No more snoozed notifications once you select snooze. --No request windows while using USSD e.g. while checking balance. --No more 'Done' notification when using USSD. --New Kinetic Scrolling mod from ancelad for Belle. --Send "Protected files" from default file browser. --Turn Off Predictive Text Input by default. --The rate of 50 frames per second. ---Number of sent messages limit increased to 2000. --Added server supl.nokia.com for GPS. --Resume broken downloads in web browser. --Added User Define Call Image by default while calling in Anna style. --Improve Call Handset and Loud Speaker Volume. --New special and unique Delight Belle startup animation. --Delight C7 as default bluetooth name. --12 Hours Time format by default instead of 24. --MheiM Fonts. (If you don't like them then replace them after reading FAQ). --Added in suffix in browser - for Indian sites. --Disabled "allow *widget* to access network?" query (always yes). --Effects folders are moved to C:\data\animations\effects now. --Better Menu structure - Reorganized. --Maximum of 10 Homescreens now, I don't think more then that is required. --Now you can write up to 4590 characters and it'll still be a text message and won't change to Multimedia message. By default the limit is 1530. --No more Ovi activation screen after startup, it’s disabled. --Change Startup animation & tone location to C:\data\Animations with special and unique --Delight Belle startup animation. --Video Editor and Photo Editor moved to Rofs from UDA so that they will exist even after a hard reset. --New messages will open in Inbox directly, not in conversation. --30+ writing languages added to Writing Languages ROFS3. --General and Meeting Profiles modded by default. --General Profile name changed to Delight. 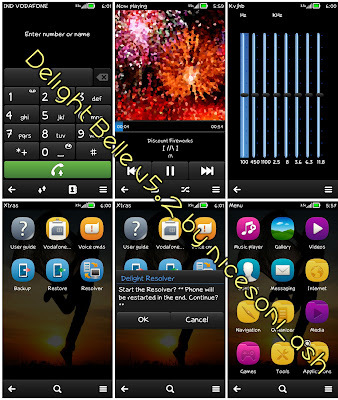 -Beautiful tone.mp3 added as default ringtone for Delight profile. -C-ute sms.mp3 added as default SMS tone for Delight profile. -Warning tones set to on and Touch Screen Vibration set to level 1. -Beep Twice.aac added as default tone for Meeting profile. -Ability to remove first Home Screen if more than one Home Screen available. -Call duration on by default. -Only Messaging and Contacts will remain in memory after exit. (I want them to start fast as well as they start at startup). -Call summary on by default. -Removed few processes from startup thus making startup a bit faster as well as save more RAM. -Fixed GPRS/WiFi information in Logs. -Auto enable Power saver mode if low battery. -Auto disable Power saver mode if good battery. -Alphabetic-numeric keyboard writing delay for writing letters changed from 1s to 0.4s. -Alphabetic-numeric keyboard delay for writing number changed from 0.6s to 0.2s. -Log cleaning up after changing SIM card is disabled. -Display light time out is half an hour now. -Few applications volume increased to maximum. -Voice Recorder - Set Recording Quality to High, Duration to 12hours and storage to E -drive. -Camera tone off option added. -Browser's cache moved to E:\ and set the amount to 32MB. -Music Gallery Folders - Music player will only search for files in E:\Music, F:\Music. -The FM Transmitter now sends RDS "Nokia C7" and not just "Nokia". -Java Permission Mod (Just change the settings from App Manager and no more annoying -pop ups in Java Apps). -Custom Logs Age Mod - Mod for changing days for storing logs. Enter your own value now. -Modded Device Manager info (only Custom firmware areas modified). -Power Saver Activate/Deactivated notifications disabled. -Notification when switching from offline to active profile disabled. -"Use Bluetooth in Offline mode?" query disabled. -"Use Wi-Fi in offline mode?" query disabled. -Play via radio turned on/off notifications disabled. -Java Permission Mod (Just change the settings from App Manager and no more annoying pop ups in Java Apps). -Custom Logs Age Mod - Mod for changing days for storing logs. Enter your own value now. -Modded Device Manager info (only Custom firmware areas modified). -Tactile Feedback (Phone vibrates once after call connected). -Shutdown Screen will have top and bottom in White color (Problem of Sysap) -After Flashing complete, your phone will restart once showing you different notifications.